This comes from a recent paper of ours (Kinnison et al., 2012). 3) Regions that are important for affective processing appear to be exceedingly well connected (e.g., Petrovich et al. 2001; Swanson 2000). This suggests that these regions have important “quasi-global” roles and that this is an important feature of this class of region. However, regions traditionally described as “emotional” are not the only ones that are highly connected. Highly connected regions are encountered throughout the brain, including in the occipital, temporal, parietal, and frontal lobes, in addition to the insula, cingulate, thalamus, and regions at the base of the brain (Modha & Singh 2010). 4) Emphasizing only interactions between brain regions that are supported by direct, robust structural connections is misleading. For one, the strength of functional connectivity is equally important, and at times will deviate from the strength of the structural connection (Honey et al. 2007). Architectural features guarantee the rapid integration of information even when robust structural connections are not present, and support functional interactions that are strongly context dependent. This is illustrated, for example, by the “one-step” property of amygdala–prefrontal connectivity – amygdala signals reach nearly all prefrontal regions within a single connectivity step (see Averbeck & Seo 2008). 5) Taken together, these considerations suggest that the mind-brain is not decomposable in terms of emotion and cognition. 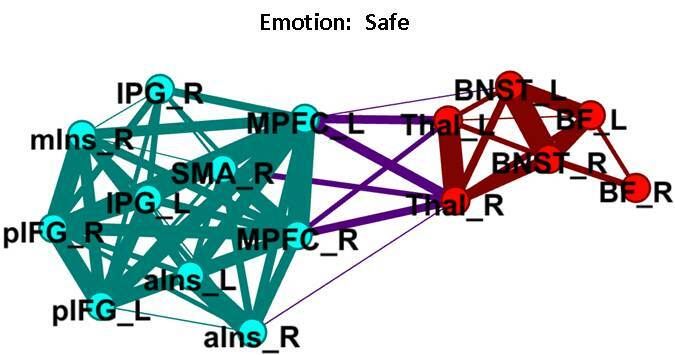 In other words, the neural basis of emotion and cognition should be viewed as governed less by properties that are intrinsic to specific sites and more by interactions among multiple brain regions. In this sense, emotion and cognition are functionally integrated systems, namely, they more or less continuously impact each other’s operations (Bechtel & Richardson 2010). As suggested by Bechtel and Richardson, “The problem is then not one of isolating the localized mechanisms, but of exhibiting the organization and the constituent functions. . . [A]n explanation in terms of organization supplants direct localization” (p. 151).